Get Your Free Second Saturdays Passes for July Now! In celebration of the League’s Centennial year, Save the Redwoods League invites everyone to experience the sights and sounds of more than 40 of California’s redwood state parks—for free! Every second Saturday of each month in 2018, Save the Redwoods League and California State Parks will be hosting a free day in the redwoods. Parking passes are available on a first-come, first-served basis each month, ahead of the next event. The next event is this Saturday on July 14 — download your free pass now! 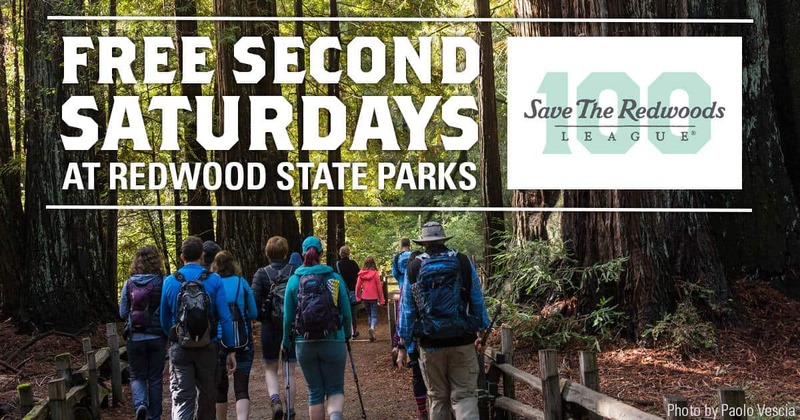 July 14 is the seventh installment of the Free Second Saturdays in Redwood State Parks, and we want everyone to enjoy and be inspired by the coast redwoods and giant sequoia. Many of these forests only exist thanks to generations of conservationists who fought hard to protect these natural treasures. Summertime and the redwoods are calling! For anyone living in Central or Northern California, the chances are good that a marvelous redwood forest lies just a short car drive away. We’ve got a park for you! Big Basin Redwoods State Park: Volunteer with the Trail Crew at 9 a.m.
Big Basin Redwoods State Park: Coffee Talk and Crafts at 9:30 a.m.
Big Basin Redwoods State Park: Family Nature Program at 10 a.m.
Big Basin Redwoods State Park: Meteor Trail Hike at 10:30 a.m.
Big Basin Redwoods State Park: Redwood Grove Loop Walk at 11 a.m. and 2 p.m.
Big Basin Redwoods State Park: Discover Big Basin Redwoods Hike! at 12 p.m.
Big Basin Redwoods State Park: Junior Rangers at 3 p.m.
Big Basin Redwoods State Park: Big Basin Nature Club at 4:30 p.m.
Big Basin Redwoods State Park: Campfire! at 7p.m. Jedediah Smith Redwoods State Park: Tidepool Exploration at 8 a.m.
Jedediah Smith Redwoods State Park: Tolowa Nation Honoring and Sharing Dance at 1 p.m. 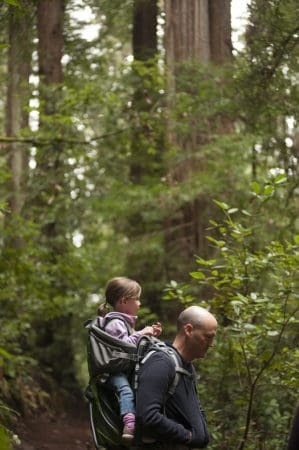 The weather this time of year can be ideal for exploring the coast redwood forests in particular. As the hot summer sun raises inland temperatures, heat clashes with incoming cold gusts from the ocean. The contrast creates moisture, which condenses into fog. Like clockwork, this cool blanket rolls in at dusk. Fog not only provides redwood forests with plenty of water, it also lowers the temperature, creating an amenable environment for hikes. Usually, by mid-day, the fog evaporates, giving way to a sunny but mild summer day. Visit FreeRedwoodsDays.org to plan your visit and to get your parking pass. (Don’t wait! Passes for certain parks go fast!) Also, be sure to sign up for the Save the Redwoods League mailing list to receive notifications when the passes to the next free second Saturday are available for download. We can’t wait to see you on the trails! Hope you join us on July 14th! 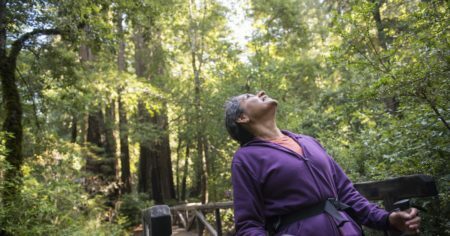 Article by Save the Redwoods League, a nonprofit organization whose mission is to protect and restore California redwoods and connect people to the peace and beauty of redwood forests. The League protects redwoods by purchasing redwood forests and the surrounding land needed to nurture them. We restore redwood forests by innovating science and technology that can improve stewardship and accelerate forest regeneration. And by protecting more than 200,000 acres and helping to create 66 redwood parks and reserves, the League builds connections among people and the redwood forests. The League’s work is grounded in the principles of conservation biology, research and improving our collective understanding and appreciation of the redwoods.